Fashion, whose Detractors have called it light, inconstant, flighty, frivolous, is however fixed in its principles; and we believe, in truth, that it is an injustice to treat it so, irrevocably, with such callousness. We see it as constant in seizing all remarkable events, in appropriating them to itself, in recording them in its annals, in ETERNIZING them in memory. What great event, what great feats of our Warriors, of even our Magistrates has it published? If d'Estang, d'Orvilliers have won, did it not announce that? did it not want Ladies to dress their heads with symbols in memory of their triumphs, and entering thus through the top of their bodies, doesn't the memory sink deeply into their hearts? Did it not impart the success of Figaro to the whole of Europe? Under how many forms did it not reproduce Janot? 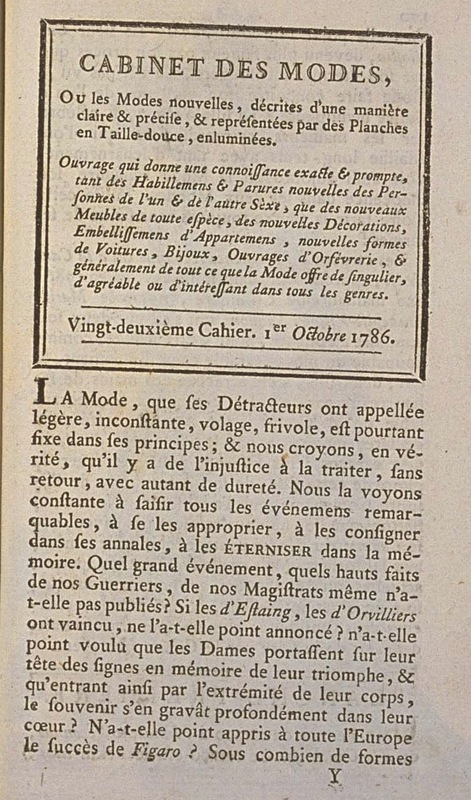 Did not M. Cagliostro, more famous for his trial than for his false immortality, see Fashion make his existence known in one and the other hemisphere? The girl Salmon, so celebrated for the extraordinary misfortunes which have assailed her for a long time with such fierceness, also sees Fashion today spill its innocence into the two Worlds. May this glory dry the always renewing source of her tears! 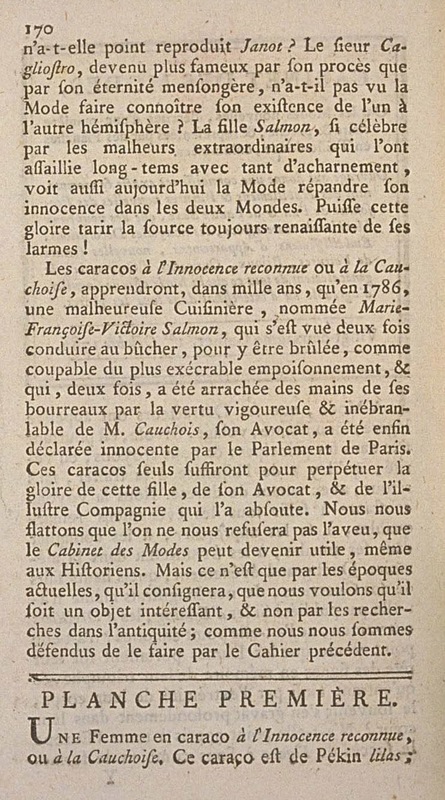 Caracos à l'Innocence reconnu or à la Cauchoise, will teach for a thousand years that in 1786, an unhappy Cook named Marie-Françoise-Victoire Salmon, who was seen twice led to the stake to be burned as guilty of the most execrable poisoning, and who, twice, was snatched from the hands of her executioners through the vigorous and steadfast virtue of M. Cauchois, her Lawyer, was finally declared innocent by the Parlement of Paris. These caracos alone sufficed to perpetuate the glory of this girl, of her Lawyer, and for the illustrious Company which absolved her. We flatter ourselves that we will not be refused the admission that the Cabinet des Modes can become useful, even to Historians. But this is only for the current times, which it will record, that we want it to be an interesting subject, and not for research into antiquity; as we defended ourselves from doing in the preceding Issue. A Woman in a caraco à l'Innocence reconnue, or à la Cauchoise. This caraco is of lilac Pekin; it is trimmed with two collars, revers, and cuffs of apple green Pekin. The revers are trimmed with large buttons of white mother-of-pearl. The caraco buttons in the front with four large matching buttons, which are applied on the front pieces, which, half-cut, are attached under the caraco and the lapels, and form a sort of stomacher. 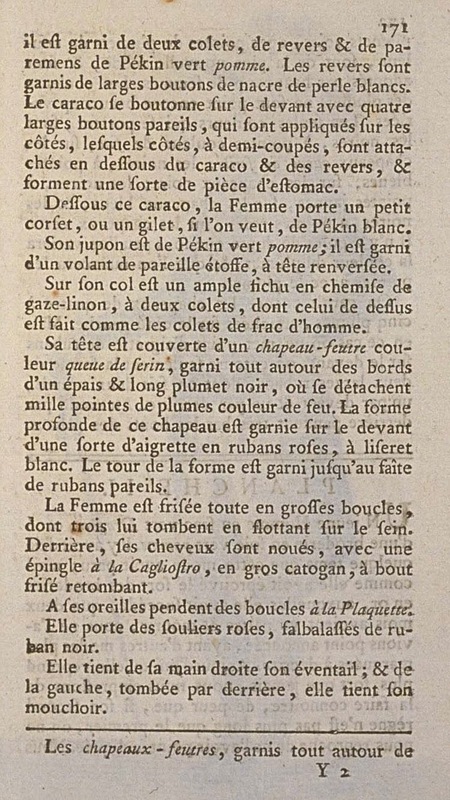 Under the caraco, the Woman wears a little corset, or gilet, if one likes, of white Pekin. 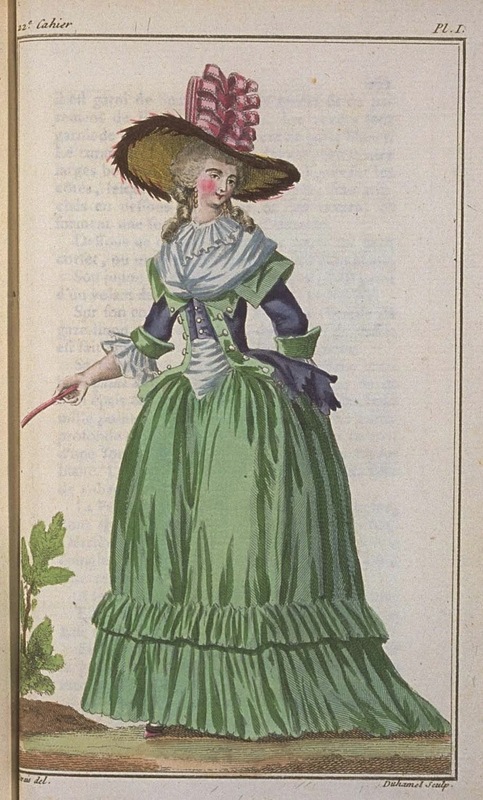 Her petticoat is of apple green Pekin; it is trimmed with a volant of matching fabric, with a reversed head. On her neck is an ample fichu en chemise of linen-gauze, with two collars, of which the top one is made like the collars of men's frock coats. 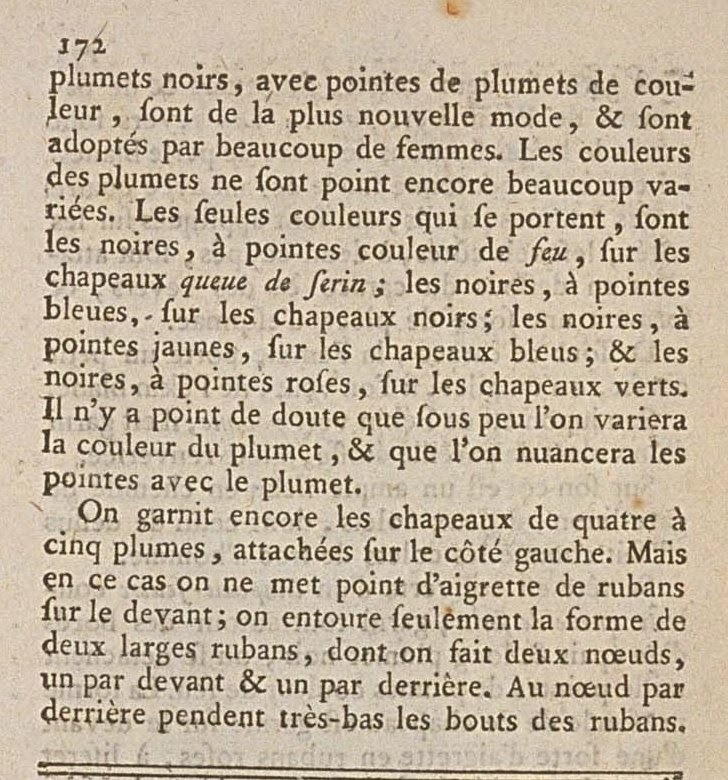 Her head is covered with a felt-hat of canary's tail color, trimmed all around the brim with an épais and a long black plume, which breaks into a thousand points of flame-colored plumes. The deep crown of this hat is trimmed in the front with a sort of aigrette of pink ribbons, with white selvages. Around the form it is trimmed up to the top with matching ribbons. The Woman's hair is done all in large curls, of which three fall to hang on her chest. Behind, her hair is tied, with a pin à la Cagliostro, in a large cadogan, curled and falling back at the end. From her ears hang rings à la Plaquette. She wears pink shoes, flounced with black ribbon. She holds her fan in her right hand; and in her left, fallen behind, she holds her handkerchief. Felt-hats, trimmed all around with small black plumes, with colored points, are in the newest fashion, and are adopted by many women. The colors of the little plumes are not still very varied. The only colors which are worn, are black, with flame colored points, on canary's tail hats; black, with blue points, on black hats; black, with yellow points, on blue hats; and black, with pink points, on green hats. There is no doubt that the color of the little plumes will shortly be varied, and that the points will be shaded with the little plume. Hats are still trimmed with four to five plumes, attached on the left side. But in this case the aigrette of ribbons is not put on the front; only the crown is wrapped with two wide ribbons, which are made into two bows, one in front and on in the back. From the back bow the ends of the ribbons hang very-low.